Mostly mild heat and the potential for mountain t-storms is ahead for your Tuesday. Mild heat and moderate to unhealthy air quality are expected to continue across Northern California today. The potential for dry thunderstorms in the mountains will increase fire danger heading into this evening and will prompt a Red Flag Warning in Northeastern California and portions of Oregon from 5pm this evening through 11am Wednesday morning. 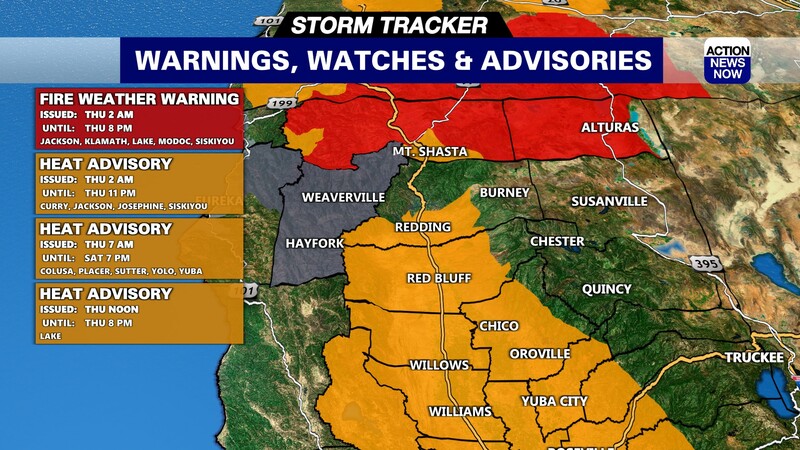 Modoc County and portions of Siskiyou County are included in that warning. Today will more than likely feel similar to Monday for the majority of Northern California. Temperatures have dipped into the low to mid 60's in the valley overnight, and into the 40's to 50's in the mountains this morning. Winds are mostly light and out of the Northeast early today, but will shift to become out of the South to 10mph this afternoon. 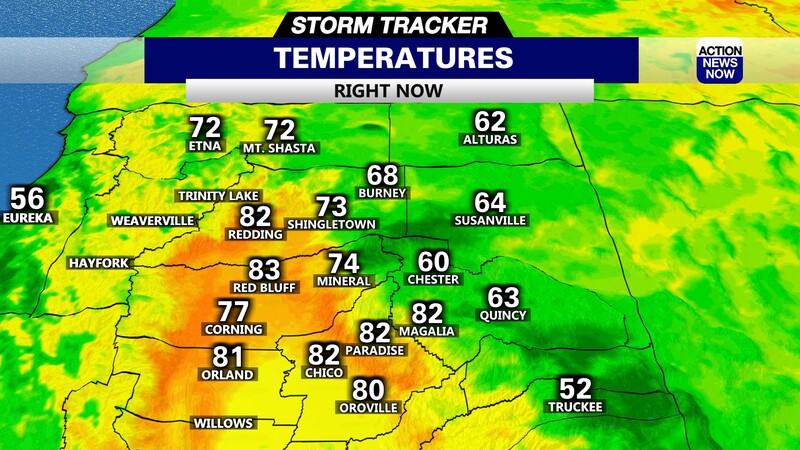 The Delta Breeze will continue to keep high temperatures in check this afternoon. Skies will be mostly clear through the day, but haze will limit visibility and air quality in areas North of the Carr Fire and Mendocino Complex Fires. High temperatures are projected to climb into the mid to high 90's in the valley this afternoon, and into the low to mid 90's in foothill and mountain areas. 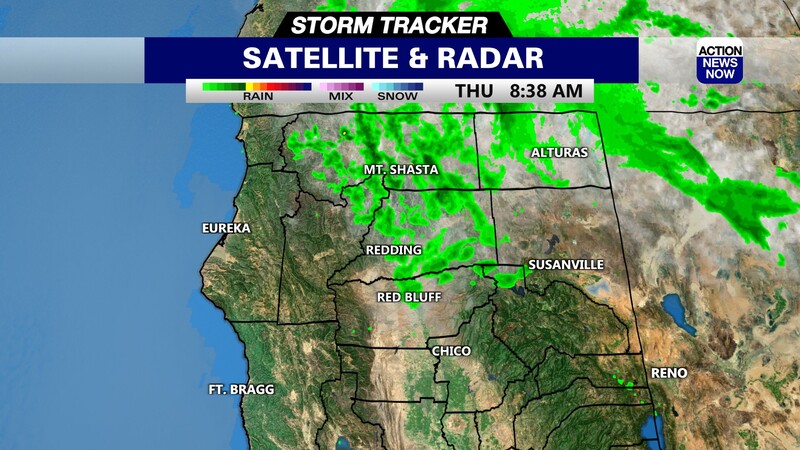 The potential for thunderstorms will return to the Sierra and Cascade ranges tonight. The best chance for active weather will be on the Eastern slopes but we can't rule out some activity spilling into the Western slopes late tonight through tomorrow morning. Dry lightning will result in elevated fire danger in some areas. There is not much change expected through the end of the week, but the potential for thunderstorms is not expected to stick around after noon on Wednesday. Temperatures will continue to climb into the mid to high 90's in the valley, while mountain areas mostly top out in the low to mid 90's. Dry weather with sunny to mostly sunny skies are ahead for the end of the week. Smoke may become a bigger concern again moving forward. We will continue to monitor air quality and bring you the latest impact projected in our region. Temperatures are expected to become slightly hotter this weekend, but models have started to bring weekend temperature projections down by a few degrees. Mid 90's to low triple digits are projected for your weekend. Overnight low temperatures will continue to bottom out in the low to mid 60's through your extended forecast.